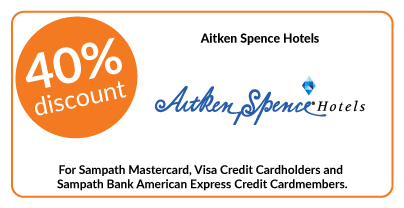 40% discount on double and triple room bookings on full board, half board basis stays at Aitken Spence Hotels exclusively for all Sampath Mastercard, Visa Credit Cardholders and Sampath Bank American Express Credit Cardmembers. (inclusive of both dates). Bandarawela Hotel from 10th – 25th April 2019 (inclusive of both dates). Eligible Card Categories - All Sampath Mastercard, Visa Credit Cardholders Sampath Bank American Express Credit Cardmembers.